The Jewish wedding ceremony vividly illustrates the notion that God is the One who both sanctifies our marriages and acts as a silent partner. 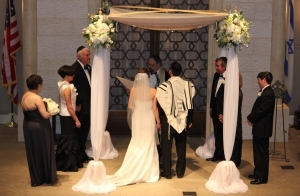 The basic ceremony consists of Kiddushin or betrothal and an exchange of rings, the reading of the ketubah or wedding contract, and Nisuin or the wedding ceremony with the recitation of the Sheva Brachot, the seven blessings recited at all Jewish weddings. Marrying your soul-mate is a wonderful and exciting event in your life. The clergy and professional staff at Temple Beth-El would love to share this fantastic time in your life. We encourage you to consider getting married right here in our beautiful sanctuary, signifying your commitment to our tradition as well as one another. However, whether you decide to hold the ceremony here or at another venue, our clergy can help make your wedding even more special, combining the basic elements of all Jewish weddings and with the personal touches you want. For more information about planning your wedding, please call the office at 933-2740. In addition, if you would like more detailed information about Jewish weddings we recommend reading either The New Jewish Wedding, Revised by Anita Diamont or The Everything Jewish Wedding Book by Rabbi Hyim Shafner, both available in our synagogue library.